well, it took four 12 foot long 2x6s, lots of plywood, two weekends, and plenty of sweat, but i finally created some more storage space in the garage. 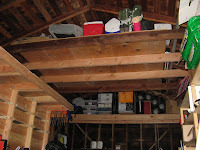 the first weekend i removed all the lighting fixtures in the garage, added two new rafters (between two existing rafters), and then covered the rafters with plywood to create a new, albeit small, storage space. the second weekend i first ripped out an existing shelf at the end of the garage (unfortunately, the old shelf spanned 2/3 the width of the garage and was at a height of 5.5 feet with a depth of about 32 inches, which meant that i couldn't access most of one wall of the garage), and installed a new shelf about 7 feet up that spans the entire width of the garage. after creating these two storage spaces i filled them up instantly. i still have to re-install some lighting fixtures, but it's really great to have the additional space.